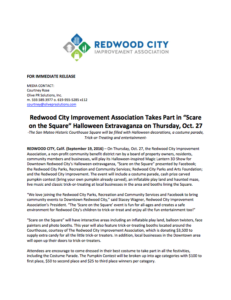 On Thursday, Oct. 27, the Redwood City Improvement Association, a non-profit community benefit district ran by a board of property owners, residents, community members and businesses, will play its Halloween-inspired Magic Lantern 3D Show for Downtown Redwood City’s Halloween extravaganza, “Scare on the Square” presented by Facebook; the Redwood City Parks, Recreation and Community Services; Redwood City Parks and Arts Foundation; and the Redwood City Improvement. The event will include a costume parade, cash prize carved pumpkin contest (bring your own pumpkin already carved), an inflatable play land and haunted maze, live music and classic trick-or-treating at local businesses in the area and booths lining the Square. “Scare on the Square” will have interactive areas including an inflatable play land, balloon twisters, face painters and photo booths. This year will also feature trick-or-treating booths located around the Courthouse, courtesy of The Redwood City Improvement Association, which is donating $3,500 to supply extra candy for all the little trick-or treaters. In addition, local businesses in the Downtown area will open up their doors to trick-or-treaters.